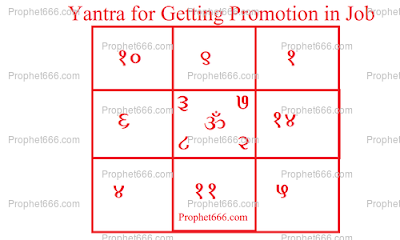 This special Hindu Yantra is to enhance the chances of job promotion, status and a better salary package. There is a special Tantra to be performed, using the Yantra given in this post. Readers, please keep in mind that the purpose of publishing these Hindu Paranormal remedies is solely to give information on rare, unknown and restricted Hindu Tantras to those who need it not to misguide or induce anyone for any selfish or motivated reasons. The Yantra, which I have shown in the image, should be prepared on any Tuesday or Thursday. It should be written with a wooden stick on a Bhojpatra with Saffron [Kesar] paste. The practitioner has to draw 100 such Yantras each day and immerse them in any water body. He should continue the Sadhana until he completes drawing and immersing 5000 Yantras in 50 days. 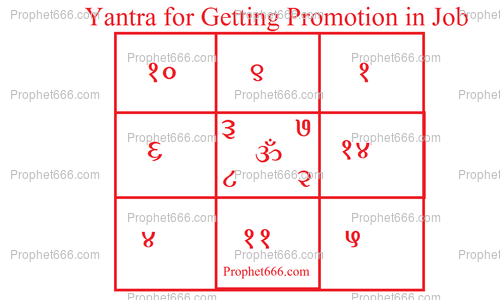 This Yantra Prayoga is believed to enhance of promotion in employment and increase the status of the practitioner. This Tantra does not prescribe any other form of worship or Mantra Chanting other than what is mention above in this post. Can i write this on white paper with red ink? You can try this remedy by using white paper and red ink.